A traditional, elegant Nordic reception organized by the Nordic chambers of commerce in Estonia: Danish, Finnish, Norwegian and Swedish to celebrate the anniversary of the Estonian Republic. This year's celebration will take place at the residence of the Swedish Ambassador, Mr Jan Palmstierna, the palace of Von Rosen at Pikk 28 in Tallinn Old Town. The event is exclusively for chamber members and is free for charge. Registration is open till February 15 at info@decc.ee A buffet dinner with wine will be offered. * Due to the very limited space, we have a set number of 20 people who can attend this year's reception. Therefore the sooner you register, the better chance that you'd be enlisted. 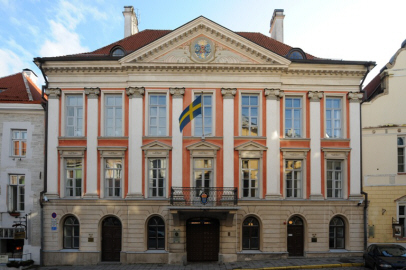 The Swedish Embassy is offering traditional embassy's services in the palace of the von Rosen family on Pikk 28. It is one of the few buildings in Tallinn that was built during the Swedish period (~1629-1710). The palace is considered be be one of the most magnificent noble houses of the city representing classical baroque style.